Londoners produce masses of it. 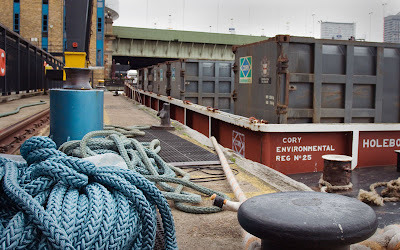 About 15% (700,000 tonnes) of it travel by barge from central London to landfills in Essex. Many want the site were these containers leave from to be turned into apartments. Mostly developers but also neighbours who want the value of their properties to increase. Others want more rubbish transported by barge. If this lot was transported by lorry we would see an increase of 100,000 lorries per year on the road. Planning for the Olympics especially improving travel has meant that anything that reduces road congestion is favoured. Looks like the barges may win. A growing problem in any large city. Recycling helps, but, only to a point. O I do hope the barges win. John Betjeman wrote a poem about Essex . . . I think the barges are a good idea. A good way to transport the rubbish. Re my birthday - I did have a tripod last year! You've got a very good memory! Maybe you need to get out more, Lol! The only camera related present this year was a book about photography composition, which is a fantastic book. Really very informative. Although I think I have got better as time has gone by its always good to see how a proffesional does it! Very intersting. Something else I didn't know about London. I really like your photo too. The angle and depth is great. that beautiful composition! thanx for visiting my blog!